It’s hard to believe that it’s now been six years of Scare the Children at our new house; at this point we’re creating mental scars for an entirely new generation of trick-or-treaters. Like last year, for this year’s event I again took on the role of the “dummy” with the candy cauldron, sitting totally still in the doorway until the kids worked up the nerve to take candy, at which point I got to move a bit and scare the bejesus out of them. I started out the night holding an iPod hooked up to a speaker that allowed me to emit a terrifying “scream” when the kids reached for candy, but at some point during the evening I must have hit a wrong button, and instead of playing a scream the iPod began playing a soothing guitar ballad – being unable to see well through my mask, and thus unable to easily fix the issue, thus ended my “screaming” for the night. Even without the canned screaming, it was still an excellent time. Among many memorable moments, early in the evening a little girl let out a terrified shriek that I was concerned might lead neighbors to call the police, and later in the evening a group of teens took five minutes trying to determine if I was real or not (“I touched the hand, and it feels kind of human-y”) before finally concluding they had been freaked out by a dummy, at which point I moved and caused two of the girls to run away while a third literally toppled over in fright – here’s the video (skip ahead to the 30 second mark); it was a good night. 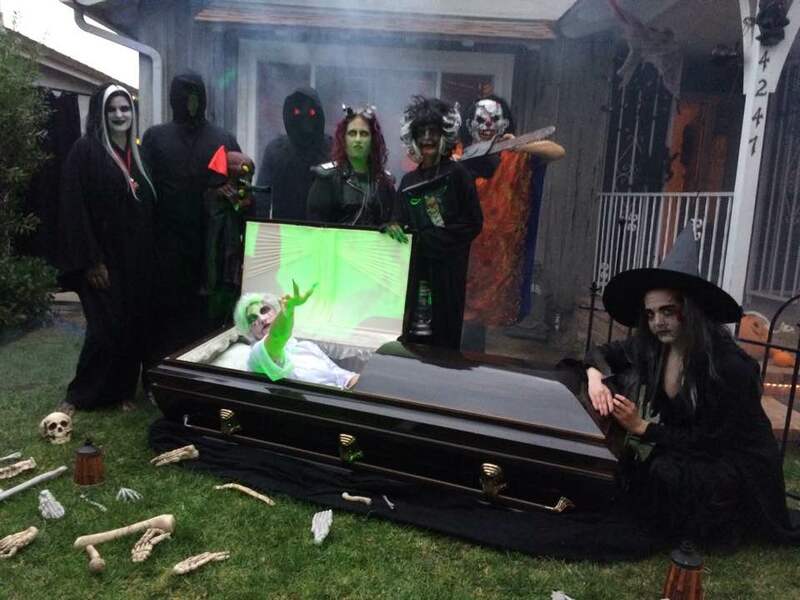 As always the entire event was a group effort, with Jocelyn resuming her role in the coffin, Ozzie doing his sixth stint as the scary clown in the alley, and Audrey, Gina and Nancy roaming the yard as haunters. Newcomer Drew was in the tree with a microphone and voice processor, Denise joined us for her inaugural Halloween and experienced the joy of being shut inside the coffin whenever Jocelyn needed a break, and Steve flew in from Boston for his second year of child scaring. Audrey and Ryan. We look amazing. “I’ll get the rest of the fake blood cleaned up later this afternoon” is not a sentence I would have expected to be saying before I met Audrey; now it’s probably going to be an annual occurrence. This year’s incarnation of Audrey’s Halloween extravaganza included a new “mad scientist lab” in the garage, since it’s not really Halloween unless someone is using rusty tools to dismember someone else. Holdovers from past years included Ozzie as a scary clown in the alley, and Jocelyn in the coffin, although Ozzie managed to up his game by finding an even creepier clown mask that he could peel away to reveal a bloody red skull underneath. Yes, it’s likely that everyone participating in this event has issues that should be addressed in a professional setting. My role in the shenanigans is typically to hide in the darkness next to our entryway and jump out at whoever actually makes it to the door, but we were shorthanded this year so I was instead tasked with handing out candy. Since sweetly telling everyone that they can have two pieces from the giant cauldron isn’t particularly scary, I instead decided to sit in the entryway without moving or saying a word, making the trick-or-treaters guess whether they were dealing with a real person or a dummy, and it turned out to be the most Halloween fun I’ve had so far. One group of teens came to the door and deliberated before approaching closer than six feet. Finally a particularly bold girl in the group crept up and poked me in the leg with a stick she was carrying, and still unsure poked me in the arm. Still unconvinced, she poked me in the cheek, and getting no response confidently told her friends I wasn’t real. When she stepped forward to grab some candy I let out a yell, and suddenly teens were running down our front walk; to my continual delight that scene was repeated many times throughout the night, and the piles of dropped candy that we found scattered over our entryway when the evening was over were a testament to the successful scaring. If you want to see more photos, or follow in the madness for next year, Audrey’s Scare the Children Facebook page has much more to see. The little kids that turned around well before the door, telling their parents “I don’t want the candy from this house”, and the teens that yelled “Oh hell no” and refused to come up the front walkway, were almost as much fun as the ones that made it to the door but ran away when the “dummy” jumped out at them. It was a good year. Our fourth Halloween child scaring event at the new house saw Ma & Pa Holliday make the trek down to Los Angeles to join in the frightening. Audrey’s mom also showed up, and she unveiled a wicked cackle during the evening’s festivities. Before the night ended my dad, dressed as an insane clown, was telling stories of how he ran out of the fog on all fours at a group kids, barking like a dog, “scaring the bejesus out of them”, so all was well. For those who want to know more, Audrey has a Scare the Children Facebook page with a more complete description of the evening’s shenanigans, as well as an account of how many children actually crossed the street to avoid being within 100 feet of our house. 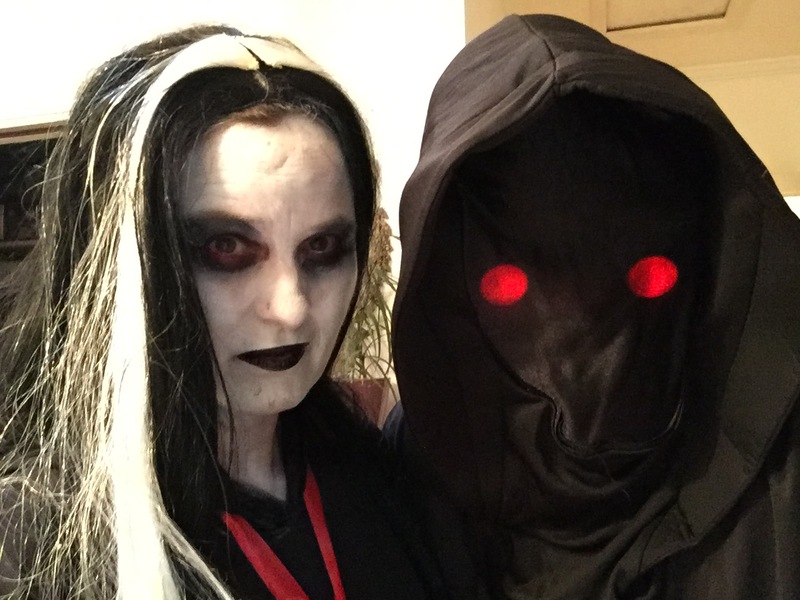 Scare the Children 2015, before it got dark and we turned on the fog machines and lights. For some reason everyone seems to remember the clown. Pa didn’t seem enthusiastic about Scare the Children until we told him we were going to dress him up as a scary clown and give him chains that he could bang into gates, to which he replied “Really? That sounds kind of cool”. Ma gets excited about everything and enthusiastically donned a purple mask and took on the job of giving out candy. For 364 days each year Jocelyn is an incredibly kind-hearted musician and children’s author, but every Halloween we paint her white and put her in a coffin. This year’s big addition was a well with images of a ghost projected into it – imagine the freaky angels at the end of Raiders of the Lost Ark, but flying up from a well. Too many people walked by not realizing what was inside, but for those who looked it was pretty creepy. Audrey added a new set of teeth to her costume. “They’re really horrific” was her enthusiastic endorsement after trying them on for the first time. I again got the best job in the world as I was dressed in all black and stationed inside of our blacked-out entryway, with my sole responsibility being to be invisible, wait until someone got close, and then growl. At the end of the night we found a pile of candy next to where I was stationed – I apparently literally scared the candy out of a few people. The proof that our efforts were worth it came early in the evening when a kid stood in our driveway for a good thirty seconds loudly repeating “it’s not worth the candy… it’s not worth the candy”. He didn’t make it to the door, but gets the honor of being a part of Scare the Children lore for years to come. Others who participated in the scaring this year included a guy dressed as a clown with an axe (“that’s really disturbing” was the initial assessment), Audrey’s current boss who made a surprise appearance and was later found hovering in a tree over the sidewalk, her friend Monty who stood completely still, looking fake, and got a few screams when he reached out at folks walking by, longtime participants Gina and Shelly, Meghen in the coffin, an executioner who didn’t take kindly to the many kids who mistook him for a ninja, and Audrey’s friend Stephanie doing logistics. Finally, in what may not have been the best move for building relations with the neighbors, our across-the-street neighbor came by and chatted with Stephanie at the door for three minutes before asking “where’s Ryan”. Unseen and six inches behind her, I whispered “Boo”. She immediately retreated back across the street, and word has it that “Ryan’s dead”. If you haven’t “liked” the Scare the Children Facebook page then you should do so to ensure you don’t miss out on important future scaring updates. Crazy busy lately. Anyhow, Halloween’s Scare the Children party started slow but was off the charts fun by the time it ended. I’d guess that about one in twelve kids were too scared to come up the driveway, and most of those that did make it up the driveway were totally freaked out. Pete, who is 6′ 7″, was our star, standing behind the driveway gate wearing a Dr. Jekyl and Mr. Hyde mask. We put a strobe on him so that it made it really tough to tell what was coming out of the dark, and he carried chains that he slammed into the gate with such force that it scared everyone, including those of us who already knew he was there. Shelley was harnassed onto the roof dressed as a gargoyle and spent the night running around shrieking at people. Gina’s costume was creepy but not particularly scary, and she just stood by the door with a lantern scaring kids more because of what they imagined she might do rather than anything she actually was doing. For comedic relief Paul roamed the yard in a zombie outfit talking to kids in a cookie monster voice, while I simply crouched behind the coffin with an ax and jumped out at people from time to time. There were a lot of highlights to the evening, but two stood out. The first was when a car drove up to our driveway, dropped a kid off, and then waited five minutes while he built up enough courage to walk up the driveway. Just as he got to the top of the driveway Pete ran at the gate with the chains, and the kid’s feet barely touched the ground as he took off down the driveway and did a flying leap back into the car. The second was when I took a turn at the door giving out candy. A kid dressed as Darth Vader ran the gauntlet and made it to the door, but he was a bit slow going back down the walk so I snuck up behind him and screeched. He literally shot about a foot and a half into the air, executed a mid-air 180 spin, and then brought his toy lightsaber down full force on my head before running away. Totally classic. Work mostly finished up for me on Friday, and Sunday we went to the house of one of Audrey’s recording studio customers to drop off a ton of equipment. It would probably be rude to mention names, but I was a fan prior to meeting the guy and was a much bigger one after meeting him. The house was way cooler than I expected, the guy was super-nice, but he also surprised me by being almost as much of a dork as I am. Nearly immediately after we arrived he told us “we’re demolishing the pool, but you need to see this first”. He then ran like a kid behind the current pool, flipped a few dials, and came out to laugh with us at the attrociously tacky pool statues that were gushing water. This was followed by him retrieving a two-foot tall garden gnome from his car which shortly thereafter became the first decoration in his multi-million dollar Spanish home. While moving equipment in he insisted on helping out, and I don’t think I’ve ever been so nervous about someone hurting themselves as I was while carrying a giant keyboard up a flight of stairs – it’s not everyday where a slight slip could cause twenty-thousand angry ticketholders to hunt you down for being the cause of their idol having to miss a show. The whole visit probably only lasted a bit more than an hour, but it was a really good time.